With such diversity in this year’s camera releases, picking the one which has impressed us the most hasn’t been easy. Yet, while many have made an impression, it’s the OM-D E-M5 which has perhaps made the greatest. Appealing to seasoned OM users, DSLR owners and those after the latest digital technology as well, the OM-D E-M5 is the perfect blend of style and technology. Its merits are too plentiful to mention in their entirety, but with a 9fps burst mode, a splashproof body designed with a tiltable display and a 5-axis image stabilisation at the forefront of the spec sheet, it’s clear even on paper how impressive the model promises to be in use. Traditionalists will no doubt appreciate a design inspired by the analogue OM series, as well as a viewfinder – albeit an electronic one – for more orthodox composition. And those after a more modern shooting experience benefit from a responsive OLED display on the rear. 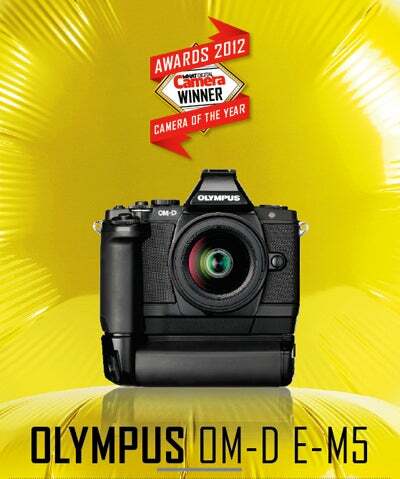 We found little to complain about with its images too – all in all, then, a fine headliner for Olympus’s CSC range.